Max Heiddeger scored a team-high 25 points and Leland King and Jalen Canty each added 21 points tonight to help UC Santa Barbara slip past visitng Hawai’i in overtime, 84-82, in Big West Conference men’s basketball action. The Gauchos improved to 17-5 overall and 6-2 in the Big West, while the Warriors fell to 13-7, 4-3. Mike Thomas led UH with 27 points and 10 rebounds, Brocke Stepteau added 13 points and six assists and Leland Green finished with 12 points, all in the first half. Gibson Johnson contributed 10 points. The Warriors opened the overtime period with Thomas’ layup to go up, 72-70, but UCSB answered with a 6-0 run and held an 83-79 lead after Canty’s free throw with 17 seconds remaining. Jack Purchase then drained a 3-pointer with 10.4 seconds left to close it to 83-82. King then made the second of two free throws a second later to put the Gauchos up, 84-82, and the Warriors’ final possession ended when Stepteau’s floater was blocked and UCSB secured the rebound as time expired. The Gauchos led, 59-50, in regulation after Canty’s reverse layup with about seven minutes remaining, but Hawai’i crept back and eventually rallied to take a brief 63-61 lead after a 13-2 run with just under four minutes on the clock. The teams then traded baskets for the next three minutes, until Stepteau’s 3-pointer tied it at 70-70 with 6.6 seconds on the clock. The Warriors used an early 10-3 run to go up, 13-8, after Green’s 3-pointer about five minutes into the game. But UCSB answered with an 8-0 surge capped by Canty’s back-to-back layups four minutes later. The Warriors came back to eventually take a 21-20 lead on Thomas’ dunk with 7:35 remaining, but the Gauchos responded with a 16-7 run to later grab a 36-28 lead, until Green closed it to 36-30 on a corner jumper about one minute before halftime. 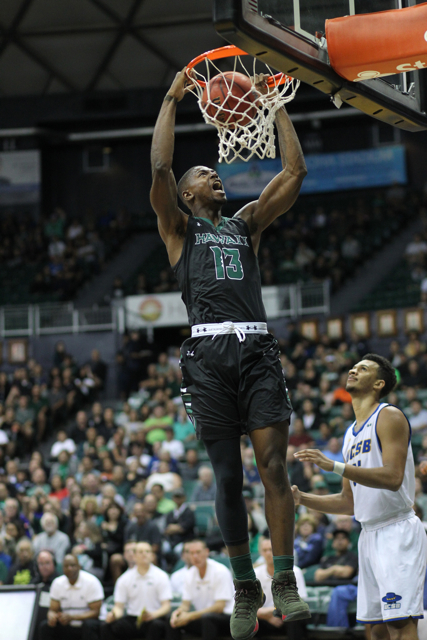 Green scored 12 points in the first half, but UH was out-rebounded, 19-11. That included a 6-2 UCSB advantage off the offensive glass, which the Gauchos directly converted into four putback baskets. No question Eran has to recruit dominant athletic talent coupled with their good defensive schemes. I thought his teams past two years should dominate league.Used to think warriors could play in PAC12…far from it. Team just focus game to game. BWC tournament NCAA bid in sight. The league appears top 8 cam win it. Super parity. Hope last 4 home games 6500 turn out every nite till senior nite.